Cardiomyopathy is a chronic progressive muscle disease of the heart that leads to electrical instability causing ventricular arrhythmias (PVCs) and loss of ventricular pump function (myocardial failure). As a result of the gradual destruction of heart muscle, affected dogs will often experience sudden death or congestive heart failure (CHF). As the disease progresses, cardiomyopathy causes a disturbance in the electrical conduction system of the heart, producing abnormal premature beats originating within the lower chamber of the heart called PVCs (premature ventricular contractions). When these beats occur all together in a run, called ventricular tachycardia, it could result in sudden death. Some signs are coughing, cyanosis or collapse. Cardiomyopathy affects many breeds (also called Familial Ventricular Arrhythmia). It is a problem in the electrical conduction system of the heart rather than a disease of the heart muscle itself. The Holter is the most effective method for identifying PVCs. There are varying opinions as to how many PVC’s are considered abnormal within a 24 hour period, but it is generally thought that 50 or more in a 24 hour period are considered affected. You should consult your veterinarian for his or her opinion. Please be careful when choosing a company to analyze your Holters. Cheaper is not better when it comes to analyzing important cardiac information. PetCardiology operates 24/7, and staffs only certified Holter technicians who actually scan the data, that is why we scan Holters for most of the nations Veterinarian Cardiologist, and the largest animal diagnostic company in the country (Idexx laboratories, www.idexx.com). Less expensive companies generally do what is called “auto scanning” a machine scan with little or no human intervention and can miss important information (this procedure is not recognized by Medicare or insurance companies for humans). Beware of companies using the word “auto report”. There is a reason “auto scanning” is not reimbursable by insurance companies for humans. We provide results within 24 hours of our receiving the data. We can also perform Heart Rate Variability (HRV) from the data if requested by your Veterinarian Cardiologist, at no additional charge. If you have your own Holter Monitor, the fee is $60.00 (Per Tape). If our monitors are used, the fee is $125.00 which includes the monitor, supplies, vest (if requested), shipping and analysis. Our Veterinary Cardiologist on staff is available for a consultation of the results for an additional $80.00. 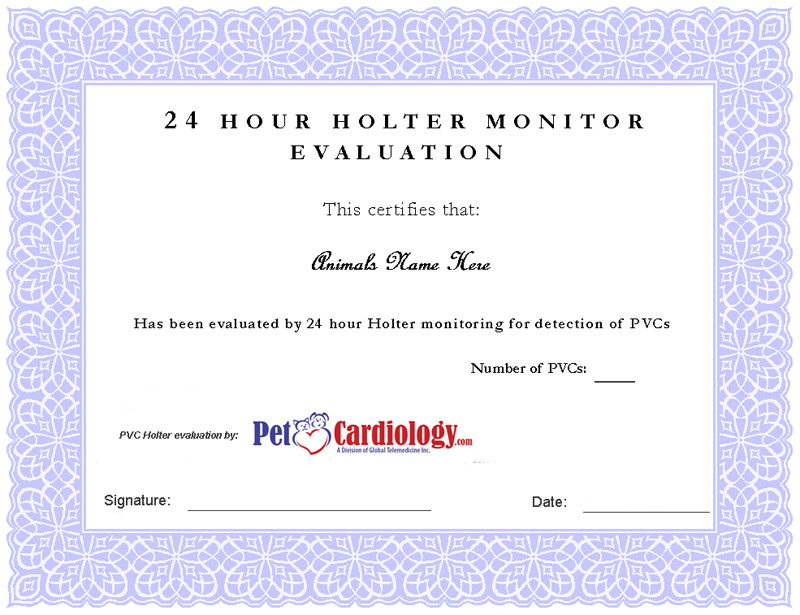 If you are interested in purchasing a monitor for yourself (or your club), PetCardiology is an excellent Holter supplier and have possibly the lowest prices nationwide. We offer traditional analogue and smaller digital devices. The digital Holters are smaller and the data can be transmitted immediately via your computer. All analogue Holters include 5 kits and 5 pre-paid and addressed envelopes. The kits will be enough to test 5 dogs or your own dog 5 times. Additional kits are $5.00 each. Vests are recommended.